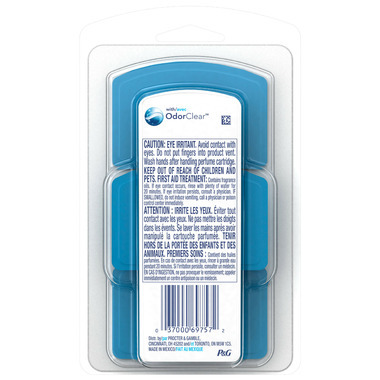 Febreze SMALLSPACES air freshener eliminates odors and freshens for up to 30 days. It's a one-of-a-kind way to keep your home's spaces smelling continuously fresh. When you adjust its base, Febreze SMALLSPACES gradually releases your desired amount of freshness. 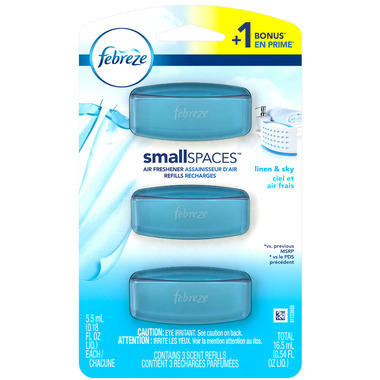 Febreze SMALLSPACES works best in small spaces like laundry rooms, bathrooms, and mudrooms. It's great for putting next to hampers, in dorm rooms, under sinks, and near shoes in closets because it’s virtually mess-free and requires no plugs or batteries. The sleek, compact design fits perfectly into any décor and works wonders from bathrooms to bedrooms, all month long. Convenient and simple to use with no plugs, no batteries, and virtually no mess. Insert curved side of scent cartridge up until it clicks. Pull base of reusable device down to adjust scent intensity. Very good find for the price. Hopefully more will come in stock.